Aplus Finetek Sensor, Inc. is pleased to announce the availability of its newest product line, the SP Series Thermal Dispersion Flow Switch for use in monitoring flow/No-flow conditions of liquids in pipes and other conduits with absolutely no moving parts for a longer life and enhanced reliability. The SP series flow switch uses proven thermal dispersion flow detection technology to detect flow and no-flow conditions. Adjustable sensitivity and alarm threshold make the SP flow switch applicable in most flow detection applications. Two thermal sensing elements are contained within the single probe element. One is maintained at a constant temperature and the other varies with the fluid flow. The temperature difference is related to flow. The SP series can be provided with solid state switch or relay alarm output. 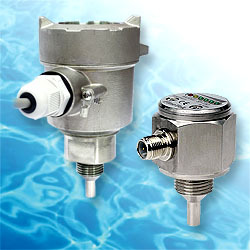 In addition to a variety of process connections the SP series flow switch is provided in stainless steel construction and with insertion lengths from 1” up to 8” in length. The SP is available for use with hazardous explosive fluids.